Find the right rental car for Naples and Italy book it directly online. 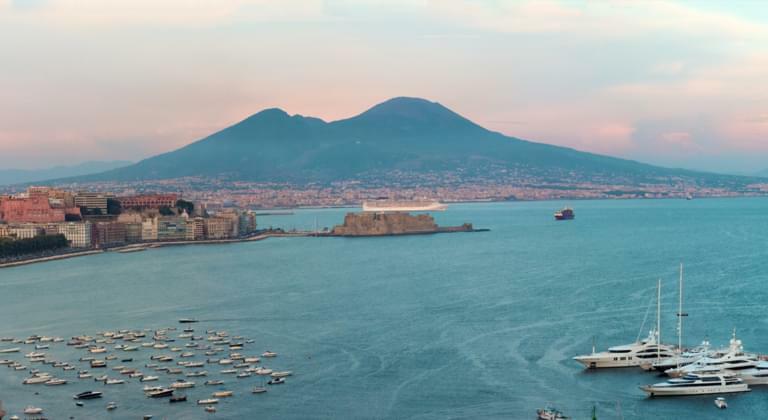 Naples has everything you could wish for a perfect holiday in Italy: the sea, culture and culinary delights. To explore all these facets of Naples and the surrounding countryside, a rental car is available. Drive in the morning by rental car to a refreshing swim in the sea, make a detour to the famous Pompeii archaeological site in the afternoon and enjoy a pizza in the old town in the evening? No problem if you are mobile with the rental car. At Driveboo it is easy to compare offers of car rental companies in Naples. Where can I rent a car in Naples? You can pick up your rental car directly at Naples Airport (NAP) or centrally in the city. This makes it easy to choose which pick-up station fits best into your travel plan. Thanks to the wide range of suppliers in Naples you will find vehicles in all categories. Do the check and compare the offers online in advance. Where can I park my rental car in Naples? Naples city center is a labyrinth of narrow lanes and winding streets. Traffic is chaotic, traffic jams are commonplace and parking spaces are scarce. In the old town, cars are mostly forbidden and it is best to walk or use public transport. It is best to park outside the city or in guarded car parks. The prices in the multi-storey car parks, for example in the Brin multi-storey car park at the "Napoli - Via Marina" motorway exit, are on average a moderate 2 euros for four hours. In addition to traditional speed checks, Italy also has the so-called "tutor" control system, which uses several measurements to determine an average speed. Scoreboards indicate the measuring points. Over speeding in Italy can be expensive. Anyone who is up to 20 km/h above the permitted speed pays at least 150 euros. What insurance do I need for my rental car in Naples? No matter where you use your rental car, you should always make sure that you have adequate insurance cover. Fully comprehensive insurance without excess "is the safest option and is definitely recommended. In addition, it is necessary to pay attention to a high liability coverage. This should amount to at least one million euros, or rather more. Driving can be exhausting in the long run. A second driver to alternate between the covering tours through Italy and around Naples makes travelling much more pleasant. An additional driver for the rental car must be indicated at the car rental. In most cases, an additional fee is due for this. If you compare some providers, you can also find offers that include the additional driver. Naples has a Mediterranean climate and hot summers. In July and August the temperatures are the highest. If you want to escape the summer heat, you can travel in May and June or September and October. In early summer and autumn it is pleasantly warm, the sea invites you for a swim and a pleasant breeze cools you down. Naples itself, Italy's third-largest city, has an old town that is a UNESCO World Heritage Site. The cathedral and the famous street "Spaccanapoli" are among the city's top attractions. A walk along the Via Caracciolo sea promenade with a visit to Castel dell' Ovo Castle is also a must in Naples. While it is best to explore Naples on foot, it is worthwhile to take a trip by rental car to the breathtaking surroundings. Close to the city, the beach baths in Posillipo invite you to take a bath. If you want even more beach feeling, you can drive your rental car directly to the Amalfi coast. Here, dream beaches line up with idyllic little towns. Pure romance! Those who are in Naples should not miss the cultural highlights and natural attractions in the surrounding area. An extraordinary experience is the ascent of Vesuvius. The cultural importance of the city is evident when visiting the ancient cities of Pompeii and Herculaneum. So that you can communicate on the streets of Italy and Naples, we have some useful vocabulary for your journey.